The Moderation Team is happy to announce our: #AshesChallenge Video Contest! What is the Ashes Challenge? Great question, random citizen. The Ashes Challenge is a viral video challenge where the participants will create a video (camera can be included if you so desire! 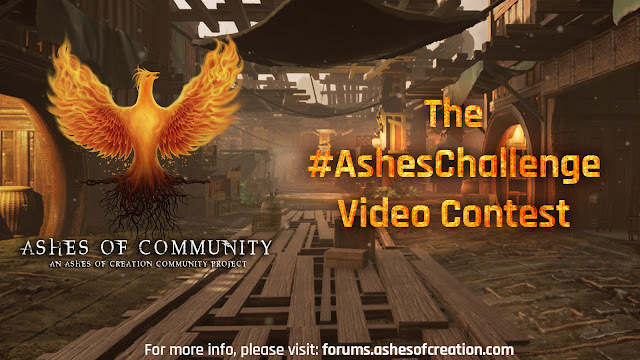 ), the title of the video must have #AshesChallenge - The video will be your reasons as to why you are so excited about Ashes of Creation, your past gaming experience where you've been let down and what you hope that Intrepid Studios will achieve. At the end of the video, you will choose 3 people from the community and challenge them to do the same. What do I get out of this craziness? Wow, that's a little selfish. No, just kidding of course we're going to reward the community. Videos that are submitted will be put into a drawing/lottery to win some grand prizes that we will announce at a later date. Where do I submit my video?